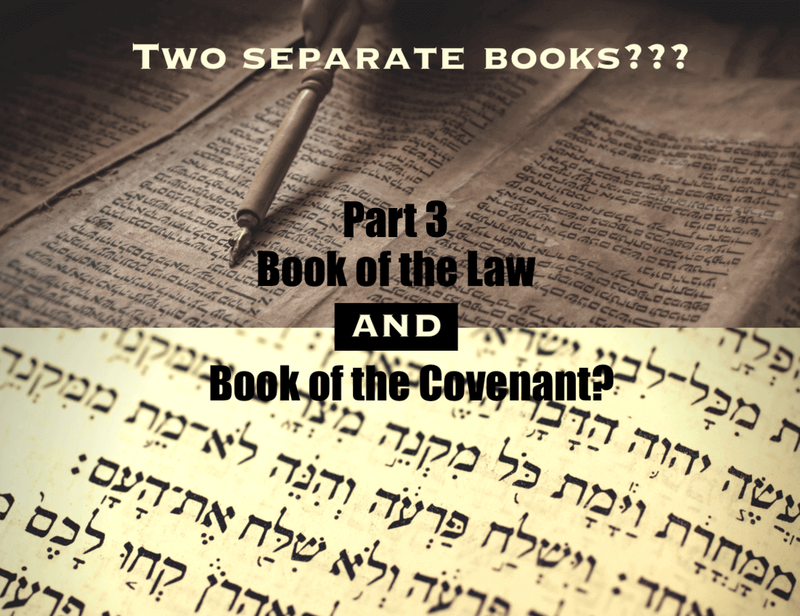 I spent a considerable amount of time in the first two parts of this series refuting the claim that there is such a thing as the Book of the Law (BOL) and the Book of the Covenant (BOC). Those who believe this claim say that the BOC and the BOL are two entirely different books and that the BOL was only given to the Israelites because of the sin of the golden calf. In part 1 I demonstrated beyond a shadow of a doubt that the two terms are synonymous throughout the Bible and are used interchangeably by both Moses and even Joshua. In part 2 I also unpacked the timeline of the golden calf event and showed how the incident happened exactly the way Exodus portrays it at the end of the first forty-day trip that Moses took up Sinai. This is significant because if the golden calf incident did, in fact, happen at the end of the trip then this entire theory is proven false. This would mean its teachers could no longer claim that the BOL was given because of the sin of the golden calf because God gives commandments from chapter 25 all the way up to the golden calf incident, commandments these teachers say are part of the BOL. Their only response to the clear biblical timeline is to say that the event didn't happen in chronological order as the text suggests. This bold and undocumented manipulation is the main pillar holding up this false doctrine. In this article, I will address the final two pillars that I believe the entire doctrine stands on: the misunderstanding of key passages in the book of Galatians as well as the misunderstanding of what was actually changed in the Covenant (mentioned in the book of Hebrews). Along the way we will most likely hit a few other scriptures, as well. Before I begin, I want to re-emphasize that this doctrine did not exist in the first century when the disciples penned what we now call the New Testament (NT). Their only concept of Scripture was what we call the Old Testament and their only concept of Torah was the five books of Moses. To them, this was called the "Law of God," the "Law of Moses," or simply "the Law." Those who teach the two-book theory have taken certain NT scriptures and have read into them this modern-day invention of a doctrine eisogetically. This kind of biblical interpretation is common among all false doctrines. It doesn't start with the original authors' cultural context or belief, but with its teacher's modern-day doctrine. It then tries to find scriptures that sound like they fit, regardless of whether or not the original author could have even thought of such an interpretation. This verse is used to retroactively give two-book theorists authority to say that the covenant made with Moses is finalized in Exodus 24:8 and nothing else can be added to it. First of all, Paul is making it clear that he is talking about covenants between men, not between men and God. Men are equals. Yahweh is not our equal. His covenants are vassal agreements that He can change if He wants to. Did He not seek to immediately annul the covenant He swore to on Sinai and instead make a new one with Moses? Did He not alter the covenant to make room for the sons of Zadok? Didn't He divorce the entire northern kingdom of Israel? I would say that's as much of an annulment as we can get! If two-book teachers are correct in their understanding of this verse then either Paul is wrong, or Yahweh annulled the Covenant illegally. Because both can't be right. Paul isn't wrong because his point is that covenants between men cannot be annulled or changed, unless they go through the proper mediator process of the courts and both parties agree. It's the same way today. But Yahweh is both the mediator and the superior Creator of the Covenant. His perfect righteousness gives Him the right to make agreements or cancel them at His will. "As previously stated, new covenants enhance the understanding of the previous covenants like layered transparencies...This is how biblical covenants work. Paul explained that that the Mosaic covenant, given four hundred and thirty years after the promise made to Abraham, did not invalidate the Abrahamic Covenant. It added to it. The Abrahamic Covenant was unconditional and was a promise that his descendants would be chosen for a purpose, and specifically that the promise would come through a particular person--the Seed, also known as Christ. The Mosaic Covenant was a conditional covenant that gave his descendants the instructions needed for daily life that they might hit their full potential as His covenant people. The Torah had the power to bless and curse them due to the fact that it was given full authority over the covenant people until the promised Seed had arrived. Once the Seed, the righteous Judge with authority over the covenant people had come, this new transparency gave a fuller picture of how the Torah was to be applied in the life of the New Covenant believer. Where it was administered by the letter of the law under strict penalties through a human priesthood, the new authority over the Law would administer it through grace and mercy based on individual cases; something the plain written law could never do. So, just as the Davidic Covenant didn't nullify the Mosaic Covenant and the Mosaic Covenant didn't annul the Abrahamic Covenant, the New Covenant doesn't nullify the Old Covenant. It only nullified the human high priesthood that was put in charge of administering it by the strict letter of the law." Now we come to the main scripture two-book teachers use to prove the BOL was given because of the sin of the golden calf. The text explicitly says that the law was given because of "transgressions." Two-book teachers read right into this scripture that that transgression must be the sin of the golden calf. But the text doesn't say anything about the golden calf incident. However, to make their theory work, two-book theorists need NT scriptures to support it and this is a good one to twist into that mold. This is a classic case of eisogesis if there ever was one. Eisogesis is reading into a text an interpretation that you already believe rather than exegetically pulling from the text exactly what it says from the author's original intent. It is, at best, academically irresponsible to make a text like this say something it clearly doesn't say and is, at worst, an intentional manipulation of the text for ulterior motives. If there was ever a good time for Paul to make it abundantly clear that everything started with the golden calf, this would have been the passage. If Paul had had ANY clue about this theory, this would have been the time to explain to these Gentiles exactly how and when the problem started. But he doesn't...because this theory didn't exist when Paul was writing. Paul's point is that the entire covenant was given because of the "transgressions" (plural) of man. It's not a single sin, like in the golden calf incident, but sins in the plural. Wasn't that the entire point of what two-book teachers call the BOC leading up to Exodus 24:8? All those laws were given because of the Israelites' sins in those areas. They didn't know what righteousness looked like so God gave them instructions on how to deal with their fellow man. This is why the Law exists, why ANY law exists, because of people's natural tendency to sin. To decipher both the rest of Galatians 3:19 and the next section, one must understand that the Law serves as the ultimate authority over man as long as the One who wrote the Law is 'out of town.' This concept comes alive through the lens of The Andy Griffith Show. In this television show, whenever Sheriff Taylor left the jailhouse, Barney Fife was in charge. Barney, the deputy sheriff, was a by-the-book, letter-of-the-law policeman. There was no grace, and there were no second chances. When Barney found Otis drunk, intoxicated, Barney dragged him off to jail. But Barney was only in charge until Sheriff Taylor walked in the door. For those familiar with the show, how many times did Aunt Bee bring lunch to the jailhouse only to have Otis beg to eat it? Barney never let him, but when Sheriff Taylor walked in , he let Otis out of jail to eat lunch, leaving Barney helpless to enforce the law. The Sheriff gave Otis grace and mercy that he didn't deserve. In the same way, the Law has full authority to govern a person as long as Sheriff Yeshua has not been given dominion over the person's life. The Law still defines sin and has the right to bless and to curse, but without Yeshua, the Law, like Barney Fife, holds the lawbreaker in custody until the time of Judgment. That's its job: to reveal sin and create a need for a Savior. When the person sees his sin and cries out for the Sherriff, the Law must yield its authority to Sheriff Yeshua and immediately release the prisoner because of His grace and mercy. From that point on, the Law still exists as the principles for living, but the person is no longer condemned when it gets broken. There is a way to be forgiven through the grace of the Sheriff that simply did not exist before. God gave the Law not just to the Israelites but to the entire world through His people. Paul wrote in Romans 3:19 that the entire world is under the penalty of the Law and "all the world may become guilty before God" because of it. Since all the world is guilty of breaking His Law, men are sinners and, therefore, are in need of a Savior. To take away the Law is to take away the only definition of sin and, as a result, remove the curse from all mankind, making the blood of Christ relevant only for the people of His day. The reason people need a Savior is because they're sinners, and sin is defined as breaking His Holy Law (1 John 3:4). Now a mediator does not mediate for the one only, but God is one. Is the law then against the promises of God? Certainly not! For if there had been a law given which could have given life, truly righteousness would have been by the law. But the Scripture has confined all under sin, that the promise by faith in Jesus Christ might be given to those who believe. Paul understood that some misinterpret him to be teaching against the Law and pitting law and grace against one another. Because of this, he made it clear that the Law is not at all against the promises of God. The two work together. The Law teaches us how to love God and one another. When we break it, Deputy Law puts us in "Jail" which creates a need for the grace of Sheriff Yeshua. The promises of God are the necessary solution: Christ is the answer through faith to the condemnation that results from men breaking His Holy Law. Do we then make void the law through faith [in Christ]? Certainly not! On the contrary, we establish the Law. This passage has given people trouble for centuries because it does appear on the outset that Christ actually abolished His own law. The problem is that Yeshua already said in Mathew 5:18 that "...till heaven and earth pass away, one jot or one tittle will by no means pass from the law till all is fulfilled" and Paul just said that he upholds the law and that Christ coming didn't nullify it one bit. Furthermore, if Paul is saying that the Law is abolished here then he is also contradicting himself from what he said in Romans 7, "I delight in the Law of God" (vs. 22) and that he desires to "serve the Law of God" (vs. 25) with his mind but with his flesh the law of sin. The only "Law of God" in the first century, as I have pointed out multiple times, is what they called the Book of the Law, the Torah of the first century. Not to mention that Paul would be contradicting his colleague John who said in his own letters that the only way to love God was to "keep His commandments" (1 John 5:3) and "His commandments are not burdensome" (v. 3). The idea that the Law of God has somehow been done away with creates so many problems, contradictions, and hypocritical statements in the scriptures that it not only pits every NT author against one another, it pits them against Yeshua and then pits Yeshua against His Father who stated that His Law was for all time, including the Millennium. Death was abolished. Our sins and the bonds that were required because of it were nailed to the cross, not the Law. This is illustrated perfectly in another difficult scripture from Colossians. The text reveals the context when it says "...having forgiven you all trespasses." The context is clearly dealing with our sin, the sin Christ dealt with on the cross. His forgiveness of our sin wipes away the "handwriting of requirements that was against us, which was contrary to us." The written law of God requires something when broken. The law stands against us when we trespass it and the "handwriting of requirements" is the 'ticket' we receive for breaking the Law. Christ destroyed the 'tickets' that the Accuser holds against us. This is why the last verse in this passage states that Christ disarmed the principalities and powers of darkness. If it were the Law of God that was nailed to the cross, He would have said He disarmed the Law of God. But the Law of God was not the problem. The problem is the enemy who uses our trespasses of the Law against us. In other words, each time we sin, those sins stand against us, written down in chapter and verse, just like a citation given by a police officer today. Those citations have been "wiped out" and nailed to the cross. The bonds of sin have been broken. The penalty has been paid. Furthermore, the phrase "handwriting of requirements" is "cheirographon tois dogmasin" in the original biblical Greek and this is the only place it's used in the New Testament. According to Vine's Complete Expository Dictionary of Old and New Testament Words, "This means a memorandum of debt, 'a writing by hand' used in public and private contracts, and it is a technical word in the Greek papyri. A large number of ancient notes of hand have been published and of these Dr. Deissmann says, 'a stereotyped formula in these documents is the promise to pay back the borrowed money..." In other words, this phrase is talking about a debt that is owed and has been written down and catalogued as a "requirement" of the debtor that must be paid. The Theological Dictionary of the New Testament adds the following: "The point of the metaphor of the 'note of indebtedness' is rather to underline the previous statement...[that] God has forgiven sins. He has canceled the note of indebtedness by taking it and fixing it to the cross of Christ" (Gerhard Kittle, 1995, Vol. 9, p. 436). Yosef ben Avraham also points out that the Friberg Lexicon explains the phrase "cheriographon dogma" as a "strictly handwritten document; in legal matters a promissory note, record of indebtedness, bond; figuratively in [Colossians] 2.14 not as the law itself, but s the record of charges...which stood against us and which Elohim symbolically removed by 'nailing it to the cross'" (Bible Works software). (13) And you, who once were dead in your sins and the uncircumcision of your flesh, he has granted to live with him, and he has forgiven you all your sins; (14) and by his commandments he cancelled the written bond of our sins, which stood against us; and he took it out of the way, nailing it to the cross. (15) and by putting off his mortal body, he exposed the powers of evil, and through his person put them openly to shame. As you can see, what at first seems to point to the Law of God being nailed to the cross is, upon further investigation, quite the opposite. The evidence is clear. God is not destroying His own constitution of His kingdom, He's paying the bond to release His bride from the prison of her sin. He's blotting out her sins and releasing her to new life. Speaking of "blotting out," it's also interesting to note that the same Greek word for "blotting out" - exaleipho - is also used in Acts 3:19. Repent therefore and be converted, that your sins may be blotted out, so that times of refreshing might come from the presence of the Lord. Again, we see a consistent theme when you take ALL the Scriptural context into consideration. Our sins and the required payments associated with them are what is being blotted out and nailed to the cross, not His Law. We know for a fact that the author is not referring to the commandment itself as weak and unprofitable because he says in the very next chapter, "Because finding fault with them..." (Hebrews 8:8, NKJV). It was the people who were weak and unprofitable which made the commandment useless to fulfill its original purpose, which was to bless. All rules and commandments in any culture at any time are only as good as those who choose to obey them. The Greek root word here for annulling is atheteo, which literally means to "to deprive a law of its force by opinions or acts contrary to it." When Yeshua died on the cross, He took our punishment and therefore "deprived the law of its force" to condemn us. His act didn't remove the law that required payment, it annulled its power to condemn us because the penalty had been paid. The word "commandment" (singular) in Hebrews 7:18 is specifically talking about the commandment that the high priest come from the line of Aaron. This particular law is fulfilled by the higher law. The pattern in the heavenlies from which the earthly pattern was copied is now beginning to merge with the earthly system. A higher High Priest has replaced the human high priest, not the entire priestly system. If the entire law (BOL) were done away with, there would be no need for a High Priest from any lineage, nor would there be a need for a heavenly tabernacle. Remember, the entire tabernacle/temple system was given in what two-book teachers call the BOL. If we're supposed to now be only under what they call the BOC, why is there a heavenly temple system, why is there a High Priest, and why is it being re-introduced when He comes back? Setting aside the human high priest and replacing the priesthood with the new High Priesthood is no different than Yahweh setting aside the tabernacle of Moses and replacing it with the new temple of Solomon. The new temple made the tabernacle tent obsolete because the new temple was better. The weakness of the tabernacle tent was replaced with the strength of a physical temple. In the same way, the Levitical high priest was being exchanged for something far stronger and much more profitable: Christ. The Covenant is only "new" because of the change in administration, not because the Law changed. The Law allows for this change and has been built into it from the beginning with the Creator's original intent of having a temple with His Angel as His people's priest and king. The people rejected this system, thus putting the Levitical system in its place. Yahweh is simply reverting back to the original blueprint. If you look at this section with the idea that the New Covenant has totally replaced the Torah, a glaring contradiction surfaces. In verse 13, the author uses the word 'obsolete.' If he meant the Torah is discarded, then why did he quote from Jeremiah 31:33, clearly stating that Yahweh will write His Torah on our hearts? The Torah is the first covenant being referenced here. Remember that in Jeremiah 31 the Hebrew word Torah is translated in the English as laws. How can Jeremiah 31 detail the writing of the Torah on our hearts in the New Covenant and the book of Hebrews tell us those very laws no longer exist? Either they're written on our hearts or they don't exist. It can't be both. This striking contradiction stands unless the author of Hebrews was not talking about completely replacing every detail of the first covenant. Rather, he specifically spoke about how that New Covenant is administered. The context is about the change in priesthood, making the human high priesthood obsolete, which legally and literally makes it brand new. Hebrews was written to help Jewish believers who didn't understand the ramifications of Yeshua taking on the new High Priestly role. They were so accustomed to the human priestly system that they could not comprehend it changing in any way, especially with the temple standing right in front of them. They struggled to comprehend the theological and practical ramifications of this priestly change. They focused on the human high priest representing them, so the author of Hebrews had to use very strong language to help them make the transition to who actually represented them now. Two-book teachers take this scripture and read into it what they want it to say so they can support their theory. They interpret it as saying that Yeshua is now the Mediator of the New Covenant, redeeming us from the transgression of the sin of the golden calf. The problem with this interpretation is that the text doesn't say anything about the golden calf. This is where they assume their own position into the text. This is classic eisogesis, reading into the text what one already believes. It leaves them blind to any other interpretation. If two-book teachers were unbiased and intellectually honest, they would have to concede that it's just as likely that the interpretation is simply that because mankind broke the Mosaic covenant that was given on Mt. Sinai (all of it, what they call the BOC and the BOL), Yeshua had to come and die to save them from sin, which is defined as breaking the Law. In other words, He simply paid their debt and freed them from sin. "There is therefore now no more condemnation for those that are in Christ Jesus" (Romans 8:1, NKJV). Again, to read into the scriptures something that doesn't exist and cannot be proven in order to increase evidence to support a theory makes a very weak theory indeed. True doctrines have indisputable scriptures, very few of which are ambiguous. This doctrine has no indisputable evidence and virtually 100% ambiguous scriptures. There is absolutely zero evidence that anyone in the first century had even heard of this theory. The NT authors' only definition of sin was breaking the Law of God, which they defined as the Law of Moses, everything given to him on the Mountain. Coincidentally, this is what John said in 1 John 3:4 (NKJV) "...sin is lawlessness." It's also the same thing that Paul said in Romans 7:7 (NKJV): "I would not have known sin except through the law. For I would not have known covetousness unless the law had said, 'You shall not covet.'" It's quite interesting that Paul quotes the Ten Commandments and calls it "the law." As you can see, from the perspective of the NT writers, there was only "the Law." There was no two-book doctrine. As I said before, and will say again, when we truly investigate this theory, it falls short of having any real evidence to support it. Virtually all the evidence it cites is either twisted to mean something the author did not intend or is completely made up to support its theory (such as changing the timeline of the golden calf incident). In the end, you the reader will have to decide whether there's enough actual, irrefutable evidence in this doctrine to feel comfortable taking the position that, if incorrect, could land you the title "least in the kingdom of God." After all, Yeshua said in Mathew 5:19 (NKJV) that "Whoever therefore breaks one of the least of these commandments, and teaches men so, shall be called least in the kingdom of heaven; but whoever does and teaches them, he shall be called great in the kingdom of heaven." Friends, what commandments is He referring to? The commandments of verse 17, what He calls "The Law." In part 4 of this series I will demonstrate just how many scriptures there really are that support the BOL ("The Law") in the NT. I'm confident that it will not only show a coherent synergy within the holy scriptures on this topic but will also reveal just how much the NT authors supported and loved the Law of God.